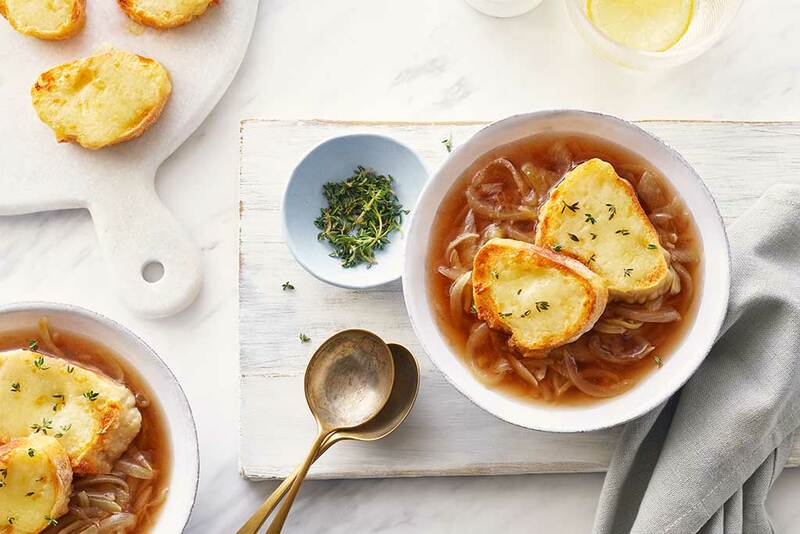 This simple, flavorful recipe delivers on the delicious flavor of French Onion Soup in a fraction of the time. In a large pot, heat butter over medium-high. Add onions; cook for 5-8 minutes, stirring often, or until golden brown. Add chopped garlic; cook 1-2 minutes longer. Add broth and bring to simmer. Reduce heat, cover and simmer gently for 15-20 minutes or until onions are tender. While soup is simmering, prepare baguette. Preheat oven to 400°F (200°C) Line a baking tray with parchment paper. Slice baguette into eight 2 cm thick rounds; transfer to prepared baking tray. Top each round with roughly 1 tbsp (15 mL) grated cheese. Set aside. When soup is ready to serve, bake baguette rounds for 3-5 minutes or until cheese is melted. Portion soup into 4 serving bowls. Carefully float 2 baguette rounds in each bowl. Rest 5 minutes before serving for baguette to soften slightly. For a traditional broiler finish: Preheat broiler to high; place four broiler-safe bowls on a baking sheet. 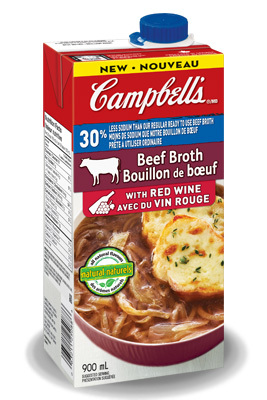 Portion hot soup into bowls; top each with two baguette slices then cover liberally with grated cheese. Broil on top rack of oven for 1-4 minutes, watching closely, or until cheese is melted and bubbly. Carefully remove tray from oven and serve. Bowls will be very hot! Try using different cheeses for an extra twist! Havarti, smoked gouda, aged cheddar or even a spicy Jalapeno cheese are all great options. Adding garlic helps to deepen flavour with a shorter cook time; increase or decrease the amount to taste.